The first lines of 7 sum up how the idea all began for Jen Hatmaker. 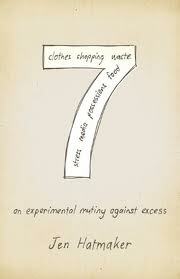 7 is the story of how the Hatmakers identified seven areas of excess in their lives for seven months. They made a plan of action to fight greed, excess and overindulgence. It is the story of their reduced life, which is the non-American but godly way. 7 months. 7 areas of excess (Food, Clothes, Possessions, Media, Waste, Spending and Stress). A lifestyle of reduction. "I will reduce, so He can increase." I cannot recommend this book enough for those looking to better their spirituality, grow with God and learn ways to reduce. It's also humorous! Watch the book trailer below for more info. Check out my Lent 2012 post on my blogmoir for a more personal lesson I learned from reading 7.